Preheat oven to 175 °C. Generously butter and flour two 22cm round cake pans. Beat together flour, sugar, almond flour, baking powder, salt and baking soda in a large mixer bowl. Add butter and beat with a whisk attachment until  butter is fully incorporated into the dry ingredients. 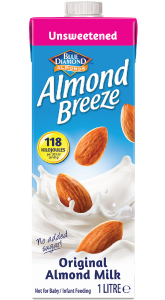 Beat together Almond Breeze, almond extract and egg whites in a small bowl. Pour half the mixture into the dry ingredients and beat on medium speed for 1 minute. Scrape down the sides and add the remaining Breeze mixture. Beat on medium-high for 1 minute more or until the batter is very smooth. Pour equal amounts into prepared pans and bake for 25 to 30 minutes or until a toothpick inserted into the center comes out clean. Let cool in pans for 10 minutes, then carefully remove and let cool completely on wire racks. To prepare frosting, beat butter until light and fluffy in a mixer bowl. Add Almond Breeze, almond extract and half the powdered sugar. Beat until very smooth, scraping down the sides as necessary. Slowly add the remaining powdered sugar and beat until light and fluffy. Spread frosting between cake layers and on the sides and top. Finish with sprinkles. *For a lighter texture, use cake flour in place of all-purpose flour. Prepare cake according to directions and spoon into 24 cupcake paper lined muffin cups. Bake for 15 minutes or until a toothpick inserted into the center comes out clean. Place frosting in a large resealable bag and snip about 1cm off the end. Squeeze gently to form a swirl and finish with rainbow sprinkles. Batter may also be baked in 60 mini paper lined muffin cups. Crumble unfrosted Breeze Birthday Cake to make 4 cups. Place in a large bowl and mix in ½ cup frosting. Shape into 24 balls. Dip the end of treat pop sticks into melted white chocolate and insert into cake pops. When frosting has hardened, dip each cake pop in melted white chocolate and let the excess drip off. Quickly sprinkle on all sides lightly with rainbow sprinkles and set on a parchment or wax paper lined baking sheet to cool and harden. Makes 24 cake pops. Puree 2 cups Almond Breeze Almond Milk Unsweetened Original, 1 cup frozen raspberries, 1 cup frozen pineapple and ½ cup Breeze Birthday Cake crumbs in a blender until smooth. Pour into glasses and garnish each with additional cake crumbs, if you like.